That reading in Isaiah since finding it has been one of my favorites but I come across another one in Exodus that hints as why God carries us on the Wings of the Holy Spirit. “You have seen what I did to the Egyptians and how I carried you on eagles’ wings and brought you to myself.” (Exodus 19:4) By the way you might make a note we usually refer to the Holy Spirit as a Dove but in Isaiah the Spirit is referred to as an Eagle. I like the reading from Exodus because if we are familiar with the exodus story from Egypt by Moses and the Israelites you’ll understand it is a little more descriptive of why God will fly us on the Wings of Eagles. I am not suggesting any of us will spend 40 years in a desert, but we will have “stuff” that we’ll not be able to endure or overcome it on our own. I am sure at some point you’ve become familiar with the Poem “Footprints in the Sand” I am not going to quote the entire reading only the last verse because it too tells of us being carried yet it is also a promise. 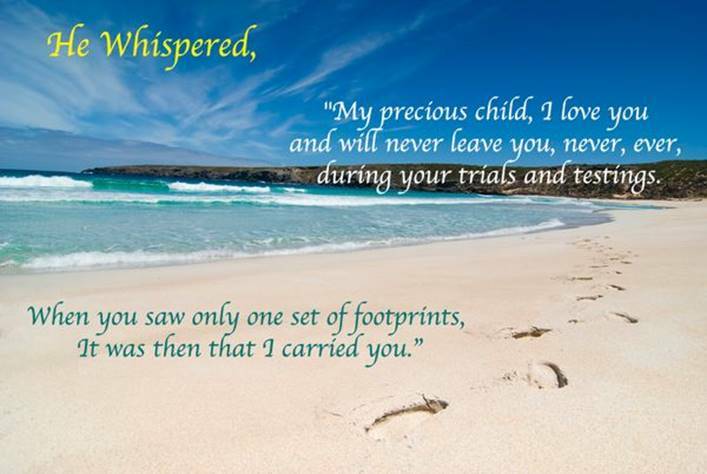 “He whispered, "My precious child, I love you and will never leave you Never, ever, during your trials and testings. When you saw only one set of footprints, It was then that I carried you." And remember what God did for Daniel Bush, Moses, and the Israelites He’ll do for you and I as well. Unless otherwise stated all scripture quotations marked CSB have been taken from Christian Standard Bible, Copyright 2017 by Holman Bible Publishers. Used by permission. Christian Standard Bible and CSB are federally registered trademarks of Holman Bible Publishers.